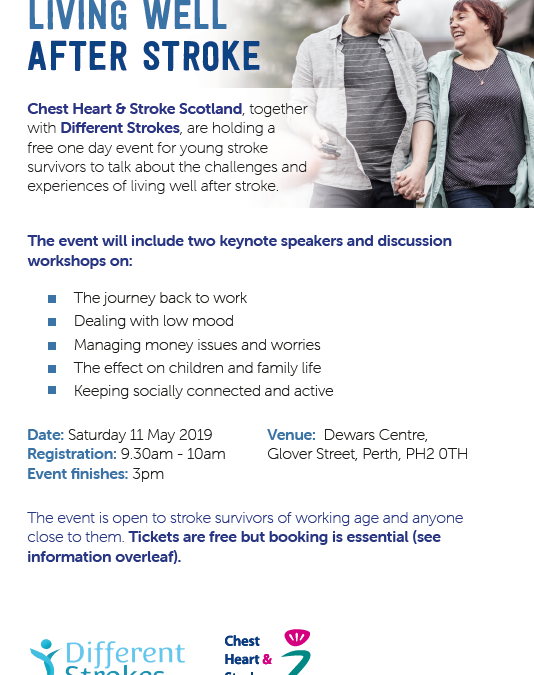 Chest Heart & Stroke Scotland, together with Different Strokes, are hosting the ‘Living Well After Stroke’ event for stroke survivors of working age to talk about the challenges and experiences of life after stroke. The free event takes place on Saturday 11th May at the Dewars Centre in Perth from 10am – 3pm. The charities are hoping to gain valuable insight from people’s lived experiences and develop future services with the stroke survivors’ needs in mind. “People often forget that stroke can happen to anyone at any age. We really want this event to raise awareness of young stroke and give stroke survivors the opportunity to share their frustration and experiences. We want to look at the most effective ways to support them following their stroke. It is so important to hear from the people that we help to make sure we are meeting their needs. To book tickets for the event please visit https://www.chss.org.uk/lwas or get in touch with Deborah Slater on 07388 378604 or email deborah.slater@chss.org.uk.